What’s the difference between a human and a banana? If you were to compare the DNA structure of a human with that of a banana, you’d find that 50% of it would be identical. Ergo, you could conceivably say we’re all half bananas. Warning: the following section has the gall to contain actual science, plus some fun facts about DNA. If your DNA influenced tendencies are telling you to run screaming in panic, you might want to skip forward to the more social stuff. Every living thing contains DNA; it is the instruction book for what makes a human a human or a banana a banana. Each rung of the ladder is made of a chemical base pair. There are only four types of bases: adenine (A), guanine (G), cytosine (C), and thymine (T). Adenine (A) only pairs up with thymine (T), and guanine (G) only pairs with cytosine (C). This is important for replication. A vertical side piece, or backbone for one side of the ladder is made of a sugar molecule, one of the bases, and a phosphate molecule. This component is called a nucleotide, and the nucleotides attach together to make a strand, shaped like a single helix. Because of the pairing limitation noted earlier, if you have a strand for one side of the ladder, you can automatically assemble the complementary strand for the other side, ending up with a double helix. That’s why DNA replication works, and cell division is possible. The double helix unzips, each side bonds to its complement components, and you end up with two copies. The ordering of the bases in a strand of DNA is the code that defines an organism. For a human, there are about three billion base letters in that sequence. Sections of DNA that code for proteins are called genes. The complete set of genetic information for an organism is called the genome. The latest estimate is that there are between 20,000 and 25,000 genes in the human genome. The size of a gene may vary greatly, ranging from about 1,000 bases to 1 million bases in humans. Genes only make up about 1 percent of the human DNA sequence. DNA outside the 1 percent are involved in regulating when, how and how much of a protein is made. Presumably, that’s how cells know how, when, and where to make a nose, a kidney, or a banana peel despite having the whole DNA code available. Every cell in the body (except red blood cells) contains a full DNA sequence. In theory, you could clone a baby from a toenail, although a stem cell would likely be more malleable. If we wanted to store all the digital information in the world, all we would need is 2 grams of DNA components and a way to sequence it. You could fit 25,000 strands of DNA side by side in the width of a single adult hair. There were some ancient viruses that used to infect humans but today, 8% of human DNA is actually made of those ancient viruses. Talk about going viral! We mentioned earlier humans have 3 billion base pairs in their sequence, but don’t get too cocky about being that complex; the Amoeba dubia have 670 billion base pairs. A mud worm is genetically closer to a human than an octopus. DNA has a half-life of 521 years. This simply means that the oldest animal or organism that can be cloned back to life cannot be older than 2 million years. Thus, replicating a dinosaur is literally impossible because they went extinct 65 million years ago. Sorry, Jurassic Park. DNA convergence between humans: 99.1%. It’s that 0.9% (or less) difference that makes it possible to differentiate between people. But why, for what should be a travel blog, have I written about human DNA convergence with a banana? Have I gone half bananas myself? Is my inner banana asserting itself? Nope. It’s all Jason’s fault. 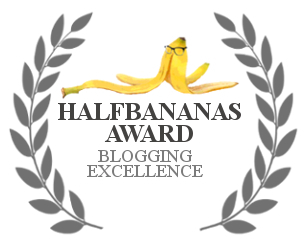 He runs the Halfbananas blog, and has opted to create a Halfbananas award, recognizing bloggers that he enjoys following. I have been named as one of the lucky recipients. Now I have to admit, the first time I was nominated for an award, the Liebster, I was thrilled. Back then I assumed awards meant you were actually creating exceptional content. This was fed in part by the path the Liebster took to get to me; both the blogger who nominated me and the one who nominated him one generation earlier are both bloggers whose content I consider to be of high quality. But then I started checking out other Liebster winners looking for great blogs to follow, and soon came to the conclusion it was more like a newbies club: it seemed to be as much about calling out newbie friends as blogs that stand out in a crowd. I saw Liebster winners who hadn’t even written 5 posts. The winners were a mixed bag, some good, some just, um, new. It’s all subjective, in any case. I thought, should another nomination come my way I’d smile internally, ignore it externally, and join the no awards club. 1. Thank me for the award by making a sizeable donation to my retirement fund. 2. Embark on a quest to locate the lost city of Atlantis and bring me the fabled golden chalice of eternal youth. 3. Invent a time machine and get me the Euro-lottery results for next Friday. 4. Display the award proudly on your blog. This is more my speed. It still suggests blogs that might be worth a look, doesn’t get too personal, and doesn’t take itself too seriously. And besides, I kind of like the award logo. Resonates with my inner banana. Not to mention, it inspired me to research the whole DNA thing. Call out blogs you think are noteworthy, with an apology to all the followers/blogs you didn’t mention due to practicality. Make up your own rules. In keeping with the Halfbananas ethos, they should be non-onerous and preferably tongue in cheek. In the meantime, channel your humane human, and should you go bananas, don’t get too rotten. What a great post. I shall be a whole lot kinder to bananas in the future. And I was surprised to learn that we’re closer to the mud worm than to the octopus. Perhaps I shouldn’t have been. People who spend time with octopuses say they’re very smart. The whole topic is kind of mind boggling. It’s amazing how dissimilar things things have sections that evolved in a similar way, for example I read one article comparing the worms DNA convergence with a human throat, and another comparing the octopus eyes with human eyes. I have to say I’m thrilled and delighted that you’ve taken the award in the spirit it was intended Dave. The fact that you’ve crafted a great, fact-filled post and included such a lot of useful banana and dna-related information brings me much joy. Loved the Atlantis quest and picture, you’re probably wise to avoid the chalice and the hangover that goes with it. I will leave you with these fine words of wisdom from the ancient sages: ‘Time flies like an arrow – but fruit flies like a banana.’ Cheers! Glad I made someone’s day. Did you notice we share nearly the same percentage of DNA with fruit flies as we do with bananas? That probably explains my terrible eating habits Dave. What a fun way to do an award! I’ve always suspected that humans are “half bananas,” but had no idea our DNA was so versatile, or so similar to a mouse’s. But that’s the fun part of blogging: I learn something new every day! Or that such a small variation in DNA can make such a difference? Tweak a couple nucleotides here and there and you get a mutation, possibly good or bad. So goes evolution. Well, that was fun! I have to admit I skimmed the science-y stuff, but the fun facts were fascinating – and humbling in many ways. I figured I’d lose most everyone by just dropping in DNA = Deoxyribonucleic Acid. Ergo, the “skip forward” link. The universe is a fascinating place, and if we’re prepared to look both much larger or smaller than our usual perspective it gets even more fascinating. Now this is a reward I can get behind! I like Jason’s style. You might say I find it a-peeling. And: I’m kinda surprised Indiana Jones hasn’t found Atlantis yet! That pun was 50% awful. I admit to being a bit nerdy, but what the heck, it just adds that much more interest to looking at the world if you expand your horizons a bit. And somehow, it seems more interesting to me than who the celebrity of the moment is dating. Cool. I have a good friend who’s a vet (and dive buddy), and at least one other follower who I think now teaches vets. And as someone who volunteers at a shelter (cattery) I have an appreciation for folks who can “talk” to patients who can’t tell you what’s bugging them. Very entertaining response. I’m a nerd too so I especially liked the science-y bit. Looks like there’s a few of us out there. 🙂 BTW, thanks for following.